In my last blog post for The Cohort, I talked about a peculiar example of historical chronology—a domestic manuscript from the late 17th century written by a teenaged boy—and I’m still interested in recovering more documents that can help us broaden and complicate the received narratives of early modern scholarly disciplinarity. ‘Weird histories,’ so to speak. 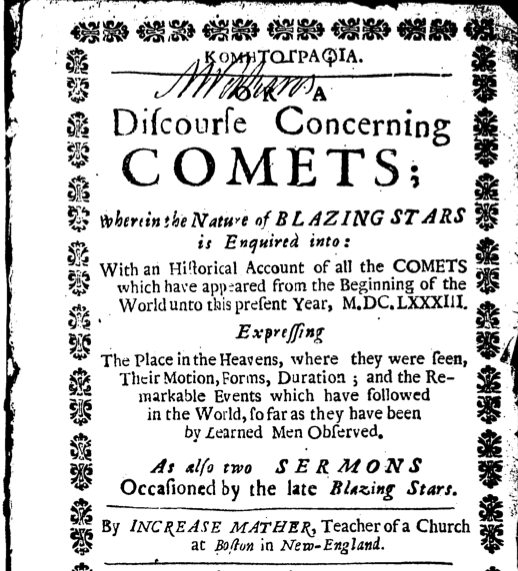 Increase Mather’s Kometographia, or a Discourse Concerning COMETS, wherein the Nature of BLAZING STARS is Enquired into… (1683) is just such a text. First, a little background: in December 1680, a very bright comet appeared that was visible all over Continental Europe, Great Britain, and North America. First discovered and named by the German astronomer Gottfried Kirch, this comet—eventually referred to as the Great Comet of 1680—was observed by Isaac Newton in order to empirically verify Kepler’s laws of planetary motion. Across the pond in early modern Boston, however, the reaction of academic authorities to the comet’s appearance was much different. Increase Mather was already the minister of North Church, the congregational church for Boston’s elites, in 1680 when the comet appeared—five years later he would be appointed Acting President of Harvard College. 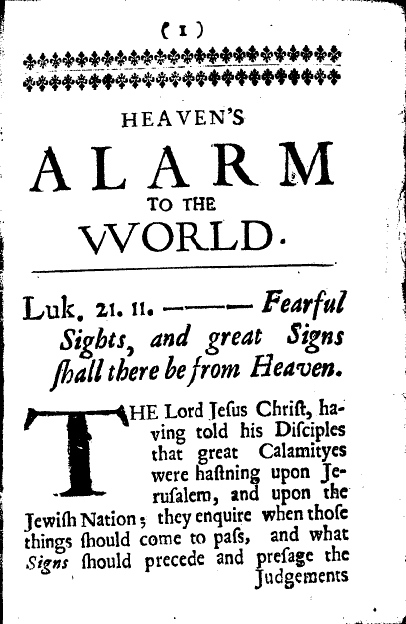 On 30 January 1681 (New Style) Mather preached a sermon on the comet to his parishioners to the effect “that prodigious awful sights and signs in Heaven, are oftentimes, the presages of great Calamity coming upon the World.” Mather quotes Josephus, Joel, and Luke for examples of heavenly signs foreshadowing calamity on earth, notably the destruction of Jerusalem. The fact that ‘the ordinary Course of Nature’—gravity, elliptical orbits, etc—governs the movement of these celestial bodies simply proves that human history and the movements of bodies in the solar system are structured by the same divine intelligence. Naturally, this reading of the comet freaked out the Puritans of Boston: they apparently asked their preacher for proof, or at least a fuller demonstration, that comets are almost always harbingers of calamity rather than, say, God’s blessing. A few years later, Mather published Kometographia, which purported to list every comet noticed by men since the creation of the world—415 of them—and then the calamities in world history that followed their appearance (the second impression of the original sermon was republished in the back of this history). Since bad things were recorded by chroniclers under the heading for nearly every year in world history, Mather had a pretty easy job. Obviously there are problems with his logic: with correlation and causation, yes, but even if we grant him that comets presage calamity, his arguments are still circular. What counts as a calamity, and what counts as a blessing? We expect Mather’s God to take some sides: the comet of A.D. 620, “about the time Mahomet began to diffuse his pesterous doctrine,” clearly signified a calamity, from Mather’s point of view. Other comets, though, are harder to read: the comet of A.D. 188 signaled that the Capitoline Hill in Rome would be struck by lightning, but also that the Britons would lose their king Lucius and become prey to the Romans. Whether the comet of 188 was a sign of disaster or opportunity for the Romans was apparently far from clear. Apart from Increase Mather’s tendentious and circular interpretations of the meanings of comets, though, what struck me about Kometographia was his struggle to keep faith and reason integrated in this pre-Enlightenment moment. In the preface, Mather goes to great lengths to disabuse his congregation of the notion that comets were either optical illusions (as Galileo believed) or atmospheric phenomena (Mather uses the observation of parallax to demonstrate their great distance from earth). Mather places astronomers Kepler, Newton, and Hevelius in conversation with chronologists like Petavius, Alsted, and Calvisius, and theologians Luther and Calvin. He stresses the mathematical logic of the comets’ appearances and movements while at the same time situating them in a larger, divinely ordered universe whose purposes can be accessed by human reason. In one sense, though Mather is writing bad logic, he’s writing a sophisticated metaphysics: given what we know about the physical laws that govern the orbits of comets, what might or could comets mean? Why are our physics the way they are? Comets call the Puritans of Boston to contrition and penance when they need to hear those messages, but the comets themselves were set in motion by God at the creation of the universe. In Mather’s formulation of the meaning of comets, we can see a strange welding together of Calvinist pre-destination and an almost Deistic conception of a Providence who expresses himself through natural law: two seemingly incommensurable positions brought into tense contact by one particularly terrifying and intellectually challenging comet. I'm a PhD candidate in English literature at the University of Michigan, where I've been studying Renaissance epic poetry, book history, the history of scholarship, and church history.